There has been progress on my quilt and progress with knitting! I find myself with more and more WIPs these days. I was always a one or two projects in the works person, but now... not so much. First of all, the quilt top is done and I really love it. I was very afraid of the mitered corners on the border but Gina, my great quilting teacher met me over at the shop this morning and refreshed my memory. They look pretty great if I do say so myself. It's not perfect by any means but I love all of the fabrics. I'm planning on a dark binding with some pops of color and haven't quite decided about the back yet. Thoughts, anyone? The top needs another press but other than that and a backing... it's ready to quilt! I think I'd use a solid color that compliments the blocks on the front --- white/ivory/navy --- something like that. The quilt top turned out beautiful. Congrats on the finish. I was thinking white for a backing, too. 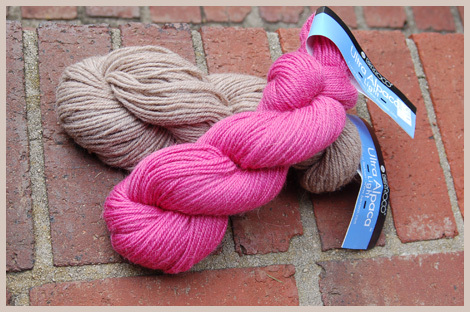 Love those colors of Ultra Alpaca Light!! Hiya Paige! I LOVE this quilt top. Love the prints/colors, love the mitered border, love it all! I think a nice solid that coordinates with the prints you've used would look nice for the back. If it were me and I were attempting to quilt it myself, I'd have to go with a busy print on the back(because my machine quilting skills are non-existent). Beautiful quilt progress...I don't know how to do that. 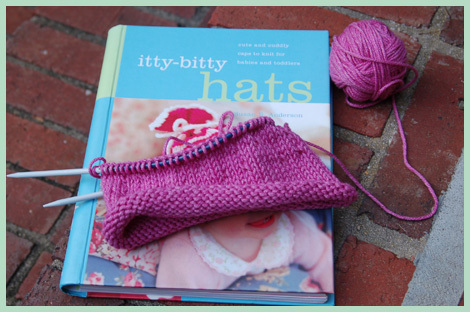 I do love to knit baby hats though! Yay, it's (nearly) finished! And it is beautiful - I love the sashing around the edges...is that what it's called? Sashing? Hmmm. I like to back my quilts with fabrics that speak to the front of the quilt - either a fabric from the front or another fabric in the same theme. 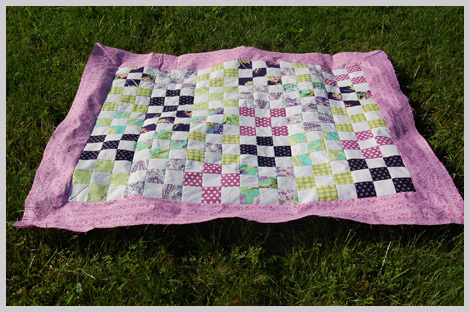 I'd be tempted to bind this quilt in either a darker version of the border fabric or in the border fabric itself - there are so many colors already, it's nice to give the eye a resting place. Just my two cents. 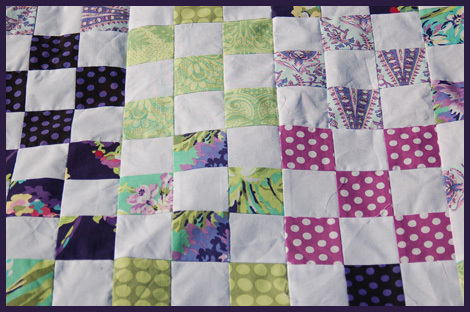 Your quilt top is so pretty! This page contains a single entry from the blog posted on June 5, 2010 8:51 PM. The previous post in this blog was Stash Enhancing. The next post in this blog is Pink and ribbons and girly, oh my!.